Every week since March Wikileaks has been leaking secrets from the United States Central Intelligence Agency (CIA), which mainly focus on surveillance techniques and hacking tools employed by its agents. However this time, the whistleblower organisation has released something different from its previous Vault 7 leaks, because it's not about hacking and spying; instead, it's a—Missile Control System. 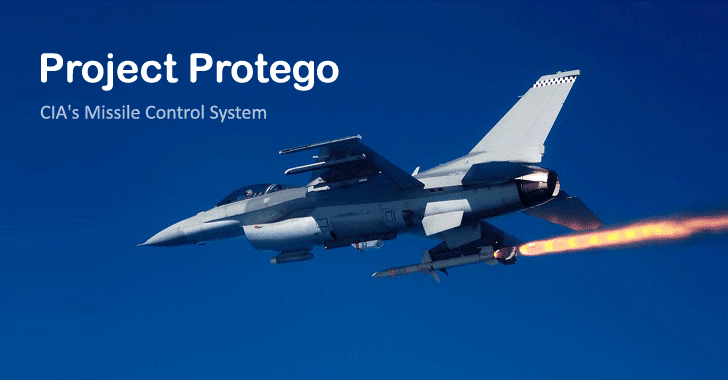 Dubbed Project Protego, the PIC-based missile control system is installed on-board a Pratt and Whitney Aircraft (PWA) equipped with missile launch system, which gives it ability to hit air-to-air and air-to-ground targets. The latest leak contains four secret documents in total from the project Protego, along with "37 related documents (proprietary hardware/software manuals from Microchip Technology Inc)," WikiLeaks says. 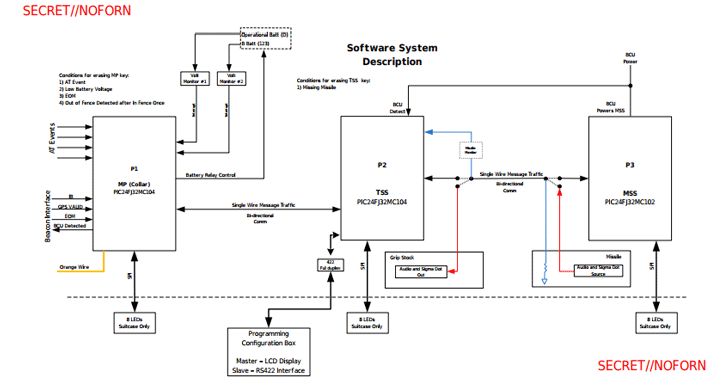 Leaked documents reveal system design, a guide on how to configure and build Protego images, and also suggest that all micro-controller units exchange data and signals over encrypted and authenticated channels. "The missile system has micro-controllers for the missile itself ('Missile Smart Switch', MSS), the tube ('Tube Smart Switch', TSS) and the collar (which holds the missile before and at launch time)." WikiLeaks is not sure why the secret documents of project Protego were the part of repositories that belongs to the CIA's Engineering Development Group, who are apparently known for developing malware and hacking tools for the agency. However, notably, the CIA has developed Protego missile control system in partnership with one of a major U.S. defence contractor, Raytheon, who was also mentioned in a previous CIA leak. Raytheon is the same company that the agency hired for analysing advanced malware and hacking techniques being used in the wild by hackers and cyber criminals. It seems the name, Protego, has been inspired from the magical Shield Charm used in Harry Potter movies, which helped from physical attacks as wells as magical. If so, then the primary objective of this missile control system could be to defend something (secret facility or base), from external physical attacks. Last week, WikiLeaks published another CIA project, dubbed AngelFire, which is an implant developed by the agency to implant a persistent backdoor on the target Windows computers by modifying their partition boot sector. ExpressLane — detailed about the spying software that the agency used to spy on their intelligence partners around the world, including the FBI, DHS and NSA. Dumbo — A CIA project that revealed the CIA's ability to hijack and manipulate microphones and webcams to corrupt or delete recordings. Imperial — A CIA project that disclosed details of at least 3 CIA-developed hacking tools and implants designed to target computers which run Apple Mac OS X and different flavours of Linux OS. UCL/Raytheon — A CIA contractor, which analysed in-the-wild advanced malware and hacking tools for help the agency develop its own malware. Highrise — An alleged CIA project that let the spying agency stealthy collect and send stolen data from compromised smartphones to its server through SMSs. BothanSpy and Gyrfalcon — Two implants that allowed the CIA agents to intercept and exfiltrate SSH credentials from targeted Windows and Linux systems using different attack vectors. OutlawCountry — An alleged CIA project that let the spying agency hack and remotely spy on PCs running Linux OS. ELSA — Alleged CIA malware that allows the agency to track geolocation of targeted laptops and PCs running the Microsoft Windows OS. Brutal Kangaroo — An alleged tool suite for Microsoft Windows operating system used by the CIA agents to target air-gap computers within an organisation or enterprise without needing any direct access. Cherry Blossom — A framework employed by the CIA to monitor the Internet activity of the targeted systems by exploiting vulnerabilities in Wi-Fi devices. Pandemic — A CIA project that allowed the US intelligence agency to turn Windows file servers into covert attack machines that can silently infect other systems inside the same network. Athena — A framework that the agency designed to remotely spy and take full control of the infected Windows systems and works on every version of Windows OS—from Windows XP to Windows 10. AfterMidnight and Assassin — Two alleged CIA malware frameworks for Microsoft Windows that's designed to monitor and report back actions on the infected remote host PC and execute malicious tasks. Archimedes — Man-in-the-middle attack tool allegedly developed by the spying agency to target PCs inside a Local Area Network (LAN). Scribbles — Software allegedly designed to embed 'web beacons' into confidential documents, making the CIA agents able to track insiders and whistleblowers. Grasshopper — A framework which let the spying agency easily create custom malware for breaking into Windows operating system and bypassing antivirus protection. Marble — Source code of a secret anti-forensic tool used by the spying agency to hide the actual source of its malware. Dark Matter — Several hacking exploits the spying agency designed to target iPhones and Macs. Weeping Angel — A spying tool used by the intel agency to infiltrate smart TV's and transform them into covert microphones. Year Zero — CIA hacking exploits for popular hardware as well as software.